All correspondences pertaining to your Doteasy account will be sent via email to the administrative contact email address we have on file. So it is important that the administrative contact email address we have on file is valid. We strongly recommend that you use an email address that is not affiliated with your domain name as it would prevent unnecessary problems should your website stops working (ie. expired hosting services or domain registration). Under the Account & Billing Profile section, click Change Contact Info. Click the Admin Contact tab. 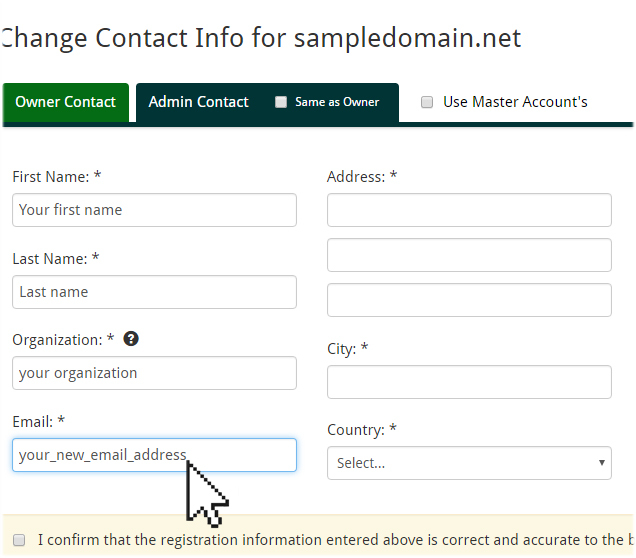 When ready, check the I confirm that the registration information… checkbox and click Save Changes.